he #1 cause of an Air conditioning system failure is Lack of Maintenance. Most homeowners in South Florida will run their system more than 3,200 hours seasonally. Such heavy demand placed on your air conditioner requires periodic, professional maintenance to extend the life of your system, lower utility bills and avoid costly breakdowns. Two professional tune-ups per year are recommended. Our Energy Savings Maintenance Plan offers a complete 19 point precision Tune-Up and Professional Cleaning twice per year. We can provide this service for as little as $179.00 per year, for one unit. HVAC system maintenance isn’t expensive compared to what you might spend if your system degrades and ultimately fails. By tracking different system indicators, you can pick up on many emerging problems before they reach a crisis situation. Think of preventative maintenance in the same way as the preventative maintenance for your car. The same holds true for HVAC systems. The overall efficiency of an A/C system, just like your vehicle is largely dependant on how well it is maintained. With Aspen Air Conditioning’s HVAC Maintenance program it’s about more than service… it’s about prevention. With typical service agreements, you pay money for priority service when there’s a problem. 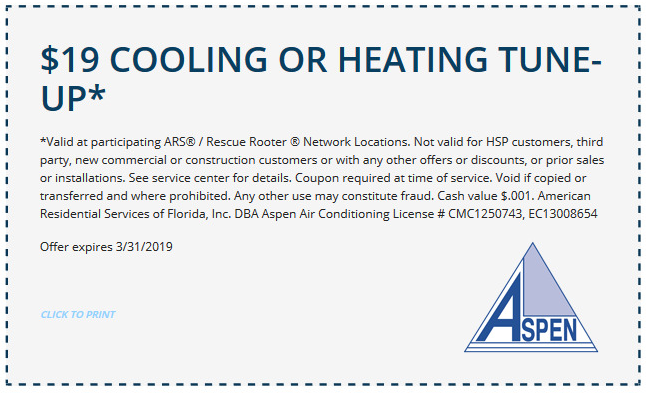 With Aspen Air Conditioning’s Comprehensive Maintenance Agreement, you not only get priority service, you can prevent those problems from happening in the first place, and save money in the process! Get the benefits of prevention with the service you expect from Aspen Air Conditioning.